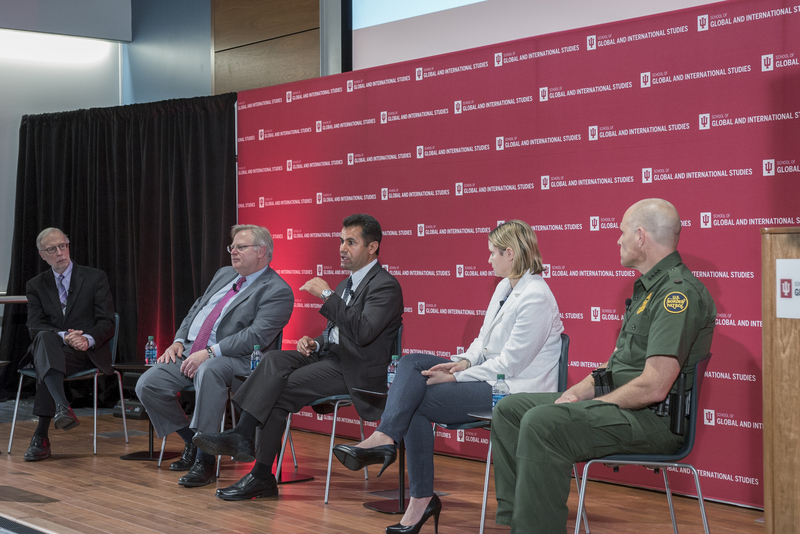 Generations of schoolchildren have memorized the Statue of Liberty’s famous inscription: “Give me your tired, your poor, your huddled masses yearning to breathe free.” But a panel of four experts on migration and displacement challenged America’s cherished self-image as a multicultural society at the conference on America’s Role in the World hosted by Indiana University's School of Global and International Studies March 28 and 29. 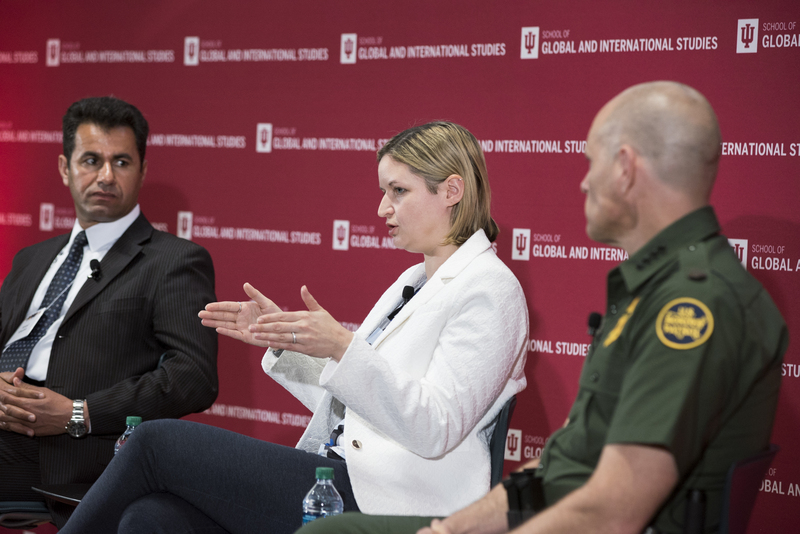 “Historically, 60 or 70 percent of Americans consistently do not want more immigration into this country and it doesn’t really change,” said panelist and historian Rebecca Erbelding, curator of the exhibition “Americans and the Holocaust” opening at the U.S. Holocaust Museum in April 2018. Resistance to new waves of immigrants is nothing new, said Erbelding, noting that in 1936 an American eugenics society debated whether to demand that the Emma Lazarus lines be removed from the statue. Panelist Eric Schwartz, the president of Refugees International, agreed with Erbelding. “Our consensus on behalf of diversity and inclusion has always been a fragile one, and it's always been dependent on our political leadership,” he noted. Panelist Asaad Alsaleh, assistant professor of Arabic literature and cultural studies in SGIS' Department of Near Eastern Languages and Cultures, put a human face on the refugee crisis. The author of Voices of the Arab Spring: Personal Stories from the Arab Revolutions (2015), Alsaleh described the suspicion he encountered as a Syrian-American trying to rent housing. He also related his recent experience interviewing refugees who have settled in Germany, where they received housing and living subsidies as well as language training. “None of those I met forgot to mention how grateful they are,” Alsaleh said. Acknowledging the humanity of refugees is fundamental to resettlement, but at the same time Alsaleh emphasized that “even those who have anti-refugee sentiments are human beings and we have to engage them.” Alsaleh highlighted the importance of integrating refugees into their new societies by creating “contact zones” where refugees and locals can meet to learn about one another. Panel moderator Dan Balz, a regular on PBS’s Washington Week and a chief correspondent at The Washington Post concluded the discussion by inviting Schwartz to share his vision for an ideal refugee policy. Schwartz proposed that the U.S. not only admit more refugees but continue to offer generous support for international humanitarian programs. By pursuing both policies, Schwartz said, America polishes its image as a “big, benign power.” Welcoming refugees to resettle in the U.S. not only demonstrates that Americans have “skin in the game,” he said, but lends the U.S. the moral authority to ask other countries to follow suit.